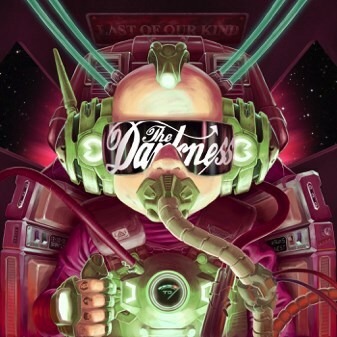 For their first two albums, The Darkness showed glimpses of brilliance. Both a parody and loving tribute to British glam rock, prog rock, classic rock and L.A. glam metal of the 1970s and 1980s, they were a unique group with a unique singer and some very silly lyrics. Combine elements of AC/DC and Led Zeppelin with Mott the Hoople and Queen (funny that Roger Taylor’s son, Rufus, is now their drummer) and that’s kind of what The Darkness sounds like. Unfortunately, the band became a parody themselves when they fell victim to their own excess, success and egos and broke in 2006. They reunited in 2011 and released Hot Cakes the following year. To be fair, it’s an album I never gave a serious listen to despite having loved their first two albums. What little I have heard never impressed me enough to listen to the rest of it. The Last of Our Kind is the band’s fourth release and something compelled me to give this release a more serious shot. I’m glad I did. This album has the band spreading out their song a bit (although it’s always kinda been all over the place) from the heavy metal “Barbarian” to the Cult-like “Open Fire” to “Mighty Wings”, which would make ELO’s Jeff Lynne proud, to the Zeppelin-esque “Roaring Water” to the southern rock of “Mudslide”. It’s riffs, falsetto singing, gang vocals and melodies galore. I’d like to point out that while Justin Hawkins is still singing in that falsetto style that made many people take notice of the band, he seems a bit more restrained and less over-the-top with it. Sometimes (especially on the first album) it seemed like his singing style was a gimmick that overshadowed the music but The Darkness doesn’t come across that way anymore. There’s lots of classic tracks from the bands first two albums, but this may be their most consistent release yet. Posted on June 2, 2015, in The Darkness and tagged The Darkness. Bookmark the permalink. Leave a comment.